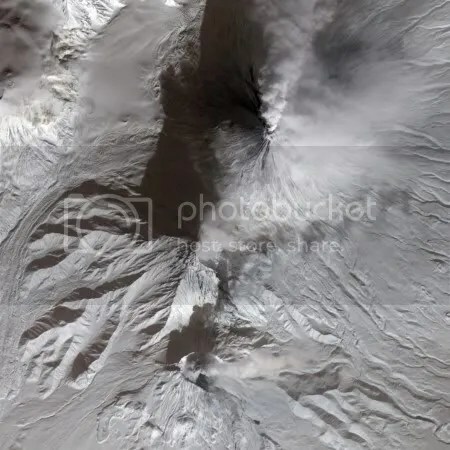 Is restless Kliuchevskoi volcano in Kamchatka heading for a larger eruption? News reports from Russia indicate an increase in activity, although the recent bulletins page from the Kamchatkan Volcanic Eruption Response Team (KVERT) has yet to catch up. Both KVERT and AVO indicate the current alert level for Kliuchevskoi remains at Yellow. Russian network CNews reports ‘bombs of many tonnes being thrown to a height of 70 metres’ and 124 seismic events being recorded over the past 24 hours, ‘with continuous spasmodic tremor’, while RIA-Novosti (in Russian) describes ‘Kliuchevskoi erupting hot magma to heights of 100 metres above the crater at 1.6 minute intervals’, and quotes a Russian volcanologist reporting the crater ‘filled with magma’ which will ‘begin to flow down the volcano’s slopes’. Pravda reports that the volcano is ‘continually shaking’ and erupting an ash plume to an altitude of ‘several kilometres’. Tokyo VAAC currently has no volcanic ash advisories for Kliuchevskoi, but the volcano has great potential for disrupting aviation so if this eruption does increase in magnitude we can expect ash warnings and aircraft diversions.